[prMac.com] Coburg, Germany - Indie software developer, Felix Lisczyk today is proud to announce the release and immediate availability of SnipNotes 2.0, the next major version of his popular productivity app for iOS devices and Apple Watch. SnipNotes combines a highly configurable clipboard manager with an intelligent note-taking app: Users can quickly save any content from their clipboard, text and images from websites, addresses from Maps and much more. SnipNotes categorizes notes automatically based on their content and provides a set of actions for each type. For example if the user stores a phone number, he can call it or send a SMS. If he saves an address, he can view it in Maps. SnipNotes integrates into notification center on iPhone and iPad, so users can save content and use actions from anywhere and don't need to open the app first. SnipNotes makes it easy to save new notes anytime. Users can pull down the notification center widget from inside any other app to quickly store text and images from their clipboard, copy notes back into clipboard, delete notes, use actions and quickly open notes in the main app. They can also save content from other apps with the share menu integration and enter their own text notes as well as images. 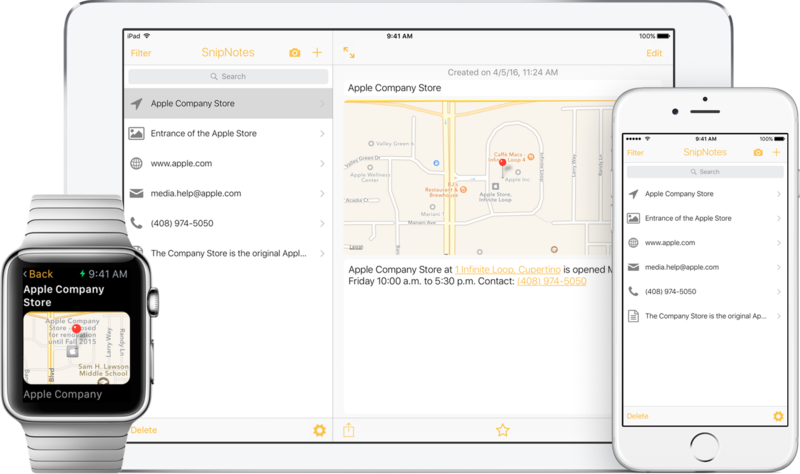 SnipNotes uses secure iCloud synchronization to keep notes accessible and up to date on all iOS devices. SnipNotes is a premium app without any advertisements or in-app purchases. Synchronization of notes takes place through the user's private iCloud account. Notes are not stored elsewhere and can only be accessed by the user. SnipNotes 2.0 is only $0.99 until 05/26/2016 and $2.99 (USD) afterwards. The app is available worldwide exclusively through the App Store in the Utilities category. Promo Codes are available to members of the press. SnipNotes was made by Felix Lisczyk, an iOS developer living in Germany. All Material and Software (C) Copyright 2016 Felix Lisczyk. All Rights Reserved. Apple, the Apple logo, iPhone, iPod, iPad and Apple Watch are registered trademarks of Apple Inc. in the U.S. and/or other countries. Other trademarks and registered trademarks may be the property of their respective owners.